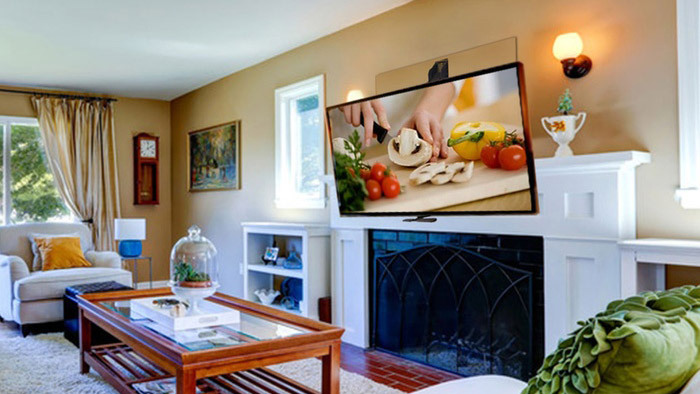 One of the best perks of a flat-panel television’s thin depth and light weight is the capability to mount it directly on a wall in your home or business to optimize its aesthetic appeal. Wall-mounting a TV can save space and enhance the visual layout of a room. To choose the correct mount for your TV, you must first decide what type of movement you want your TV to be capable of, or if a fixed position mount better suits your needs. Next, confirm the exact size and weight of your TV so you know which mounts are rated to meet those specific measurements. 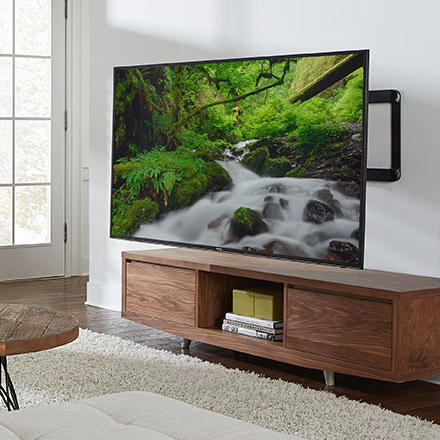 It is vital to follow those restrictions to prevent your mount from sagging under the weight of a TV that is too large for its frame, or worse, causing the structure to fail, resulting in damage or injury. Choosing a mount that is fixed or not depends on the layout of the room, intended audience and what you personally prefer. 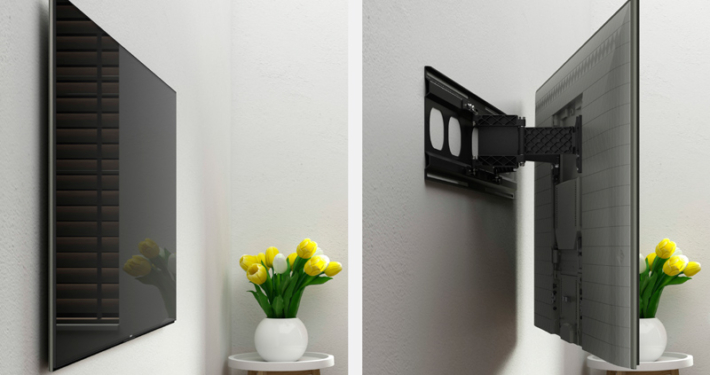 Fixed TV mounts will hold the TV snug and flush against the wall, keeping it closer to the wall than any other mount for a clean, polished look. 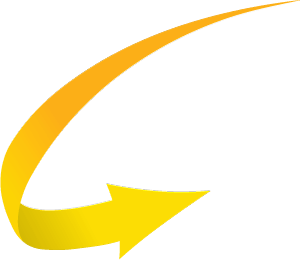 A fixed mount, assumed by its name, offers no position adjustment. Fixed mounts perform the best in rooms where there is complete control over the lightning to avoid glare on the TV screen and where people will always view the TV from the same position, which is ideally centered in front of the TV. While still maintaining its position on the wall, tilting mounts allow your TV to be angled vertically but not horizontally. In installations where a TV is being mounted higher than normal, a tilting wall mount is recommended. For example, a TV being mounted over a fireplace using a tilting mount will allow the display to be angled downwards toward the viewer. 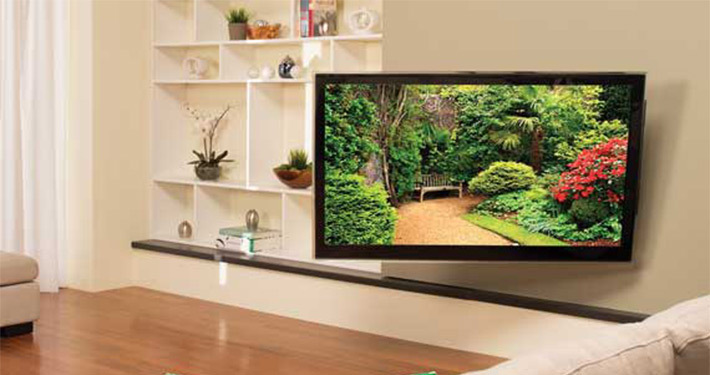 Tilting mounts offer some control over the glare on your TV screen from windows and lights. Based on the model of the mount, viewers can expect between 5-15° of vertical tilt adjustment. Full-motion, or articulating mounts, are the most versatile style of mount that offers the greatest range of movement for your TV. Articulating mounts allow you to tilt the TV up or down, move the TV towards or away from the wall and angle it from side to side. 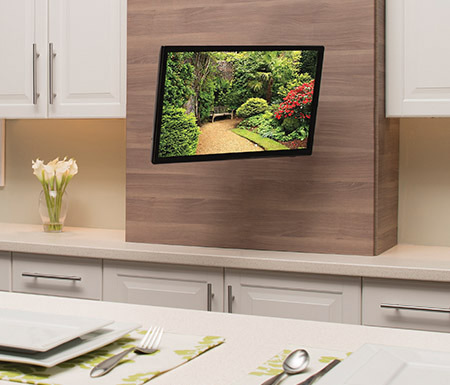 Full motion mounts guarantee the perfect view of your TV at every angle, suitable for rooms where viewers have a variety of options for where they choose to sit and easily combats glare from continuously changing sun exposure. 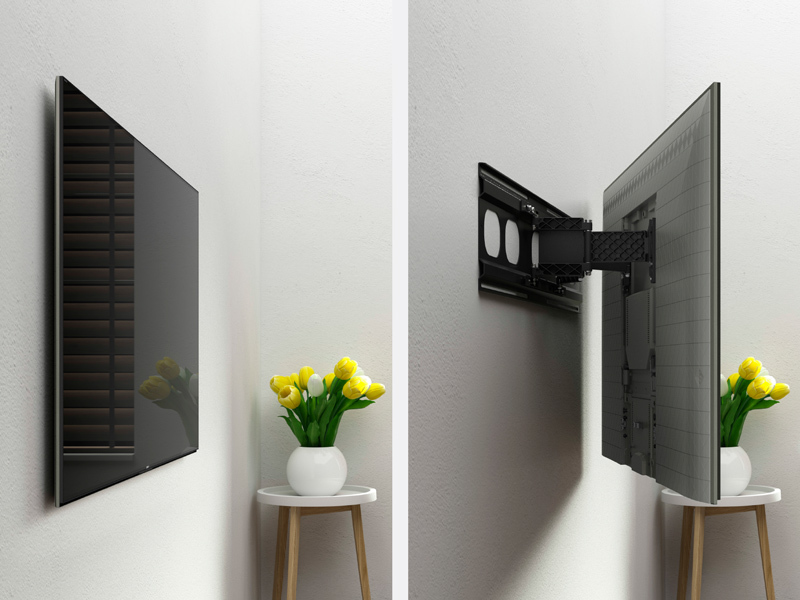 Full motion mounts also allow for more innovation when it comes to installation possibilities, such as hiding your TV into a structure from which you can pull it out from or in the corner of a room. 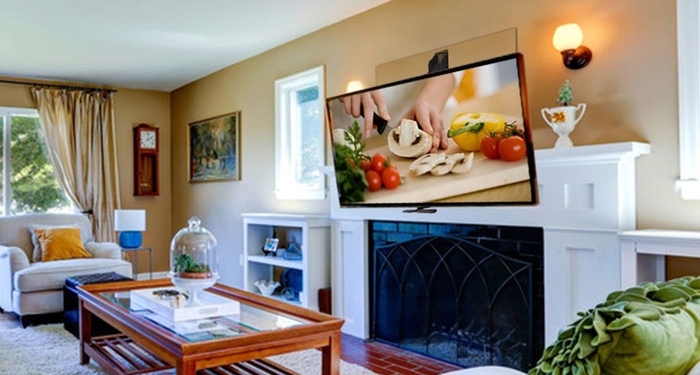 Quest4 Electronics has a wide selection of mounts to fit every TV and a solution for all customer’s looking to add mobility to their displays, or simply wanting to mount their TV on a wall. We offer the industry’s most durable and highly rated mounting options. Our team specializes in custom installation and can expertly advise you on the perfect mount for your TV and living area. Ready To Mount That TV? Contact our Quest4 Experts for a FREE Consultation.